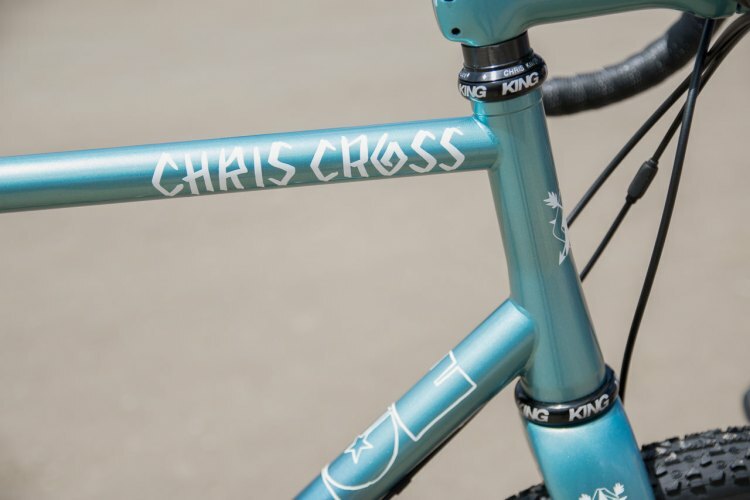 Chris Chance started building bikes in 1977, creating road racing, time trial, criterium, and touring steel brazed frames. He started Fat Chance Cycles in Somerville, Massachusetts in 1982 at the dawn of mountain biking, bringing his East Coast ethos to the burgeoning sport. 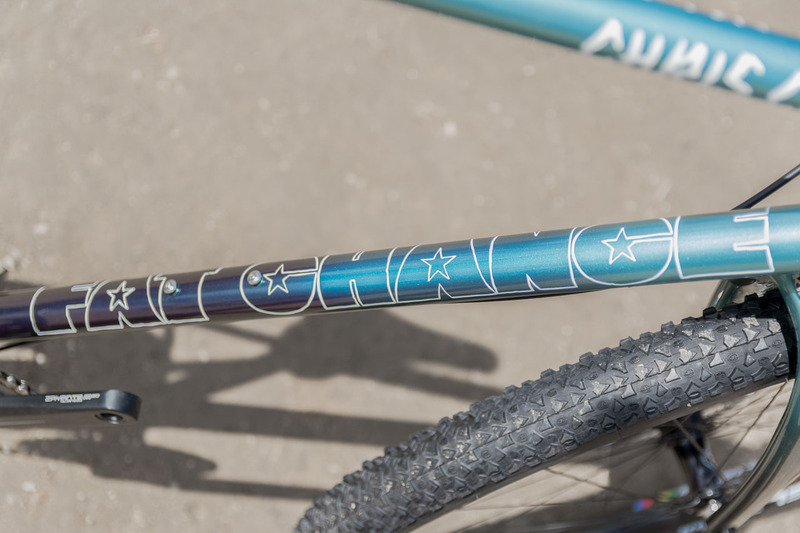 Fat Chance mountain bikes became coveted rides with their aggressive geometry, bright paint and fun graphics. 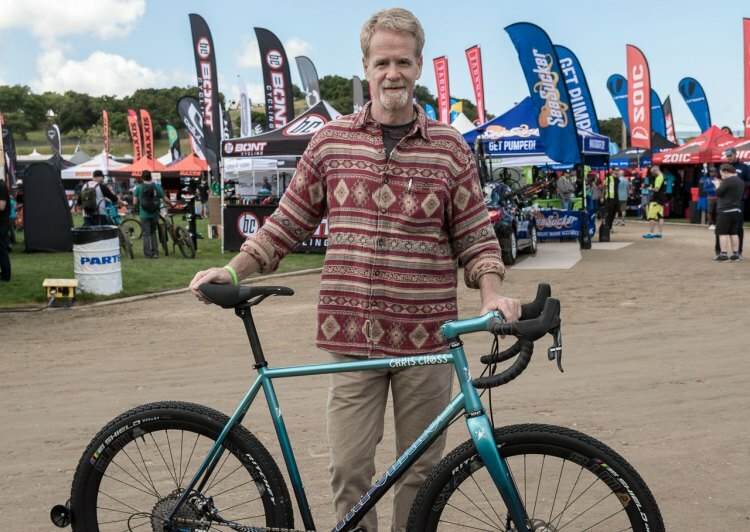 We spied Chris and his new Chris Cross cyclocross and gravel bike at Sea Otter 2017 in several configurations that demonstrated the bike’s versatility. 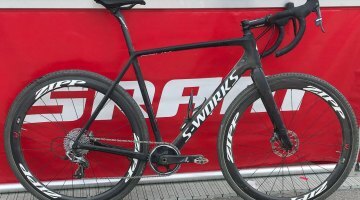 It will be sold as a frameset with pre-orders for August 2017 delivery available now. Chris is not personally building the bikes at this time, but oversees the project with his friends at Co-Motion cycles in Oregon. The Chris Cross’ main triangle is Reynolds 853, while the rear triangle is Columbus Zona Nivacrom. 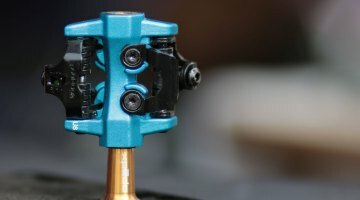 It has flat mounts for the disc calipers and is 12mm X 142mm thru-axle with removable fender mounts. There are threaded provisions for fenders on the seatstay and chainstay bridges. 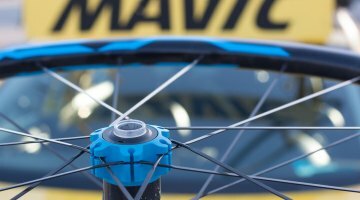 If you want to go with a racy look, remove the dropout eyelets and use the Enve fork option. 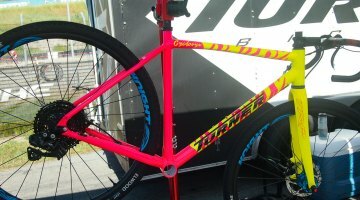 If you want to put fenders on, the TRP CX fork has previsions, as does the Yo CX steel adventure fork option. 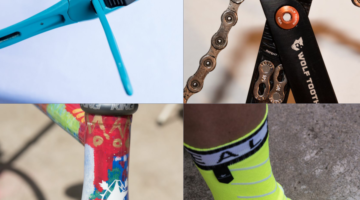 The latter also has triple threaded bosses on each fork leg for water bottles or other bolt-on accessories and adventure mounts. 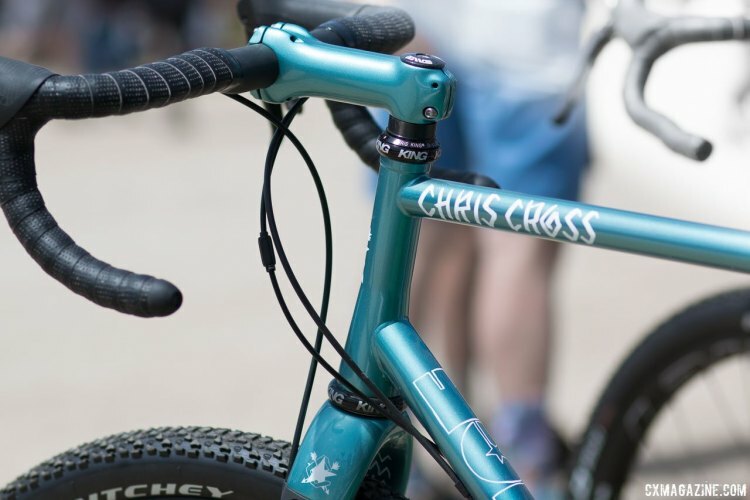 The Chris Cross has a very elegantly tapered head tube for the fork options. Twin water bottle bosses are on the usual down tube and seat tube locations of the frame. Control lines are run externally along the down tube with full housing if you are running cables. Tire clearance is wide enough for a 700C X 40mm tire, or a 650B X 52mm (27.5 X 2.1”) tire and the different models on display proved it. 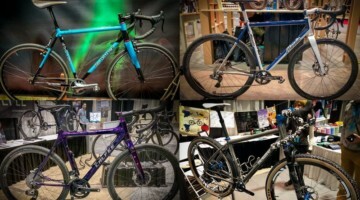 The base frame price is $2195 USD with a Ritchey cyclocross fork. There are other fork options as mentioned above as well as. Build kits will be available on the Fat Chance bikes website soon.